There’s a confusing, bureaucratic mess playing out right now at the Consumer Financial Protection Bureau, an independent federal watchdog that oversees financial institutions. And it could scuttle a possible lawsuit the agency was preparing against a bank notorious for issuing subprime auto loans. The issue started on Friday, when the CFPB’s director, Richard Cordray, abruptly stepped down from the position. Hours later, he appointed Leandra English, a veteran of the agency, as deputy director. Cordray explained in a letter that the appointment meant she would be the CFPB’s acting director under the law that created the agency, reported the New York Times. That left the agency in a bureaucratic limbo, with two interim directors and no clarity as to who’s actually running it. English filed a lawsuit late Sunday night, aiming to block Trump’s appointment. 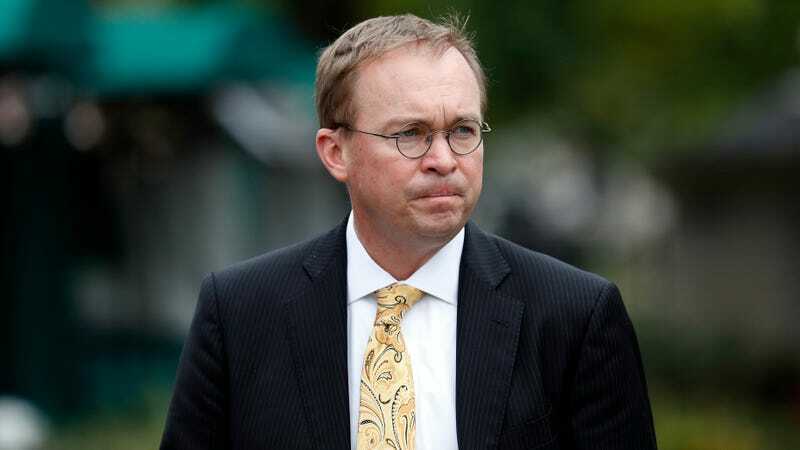 Mulvaney immediately asserted himself as the director, even amid the legal questions, to CFBP staff upon arriving on Monday. Mulvaney’s appointment could be a huge win for Santander bank, a Spanish financial institution that’s come under increase scrutiny this year for issuing subprime auto loans that, regulators say, it shouldn’t have. Reuters reported on Friday that the CFBP was preparing to file a lawsuit against Santandar over auto loans. According to the sources, the lawsuit centers on a financial product, known as ‘guaranteed auto protection’ (GAP), that can shield a car buyer from some of the expense of a serious collision. If a driver’s auto insurance only covers replacement cost, GAP coverage may cover the entire balance of the loan. Consumers often purchase GAP insurance in the dealer showroom and the costs are built into the car loan. Federal and state officials have been looking into whether consumers have been paying for unneeded GAP insurance or have seen their loan rates climb too high when GAP coverage was added. That case could be in limbo now, as the International Business Times pointed out. The IBT reviewed federal records that showed Mulvaney’s recently-departed chief of staff is now working as a lobbyist. Federal records show Mulvaney’s longtime staffer is Natalee Binkholder, who left Mulvaney’s office to work as a top lobbyist for Santander - a major bank. The records show Binkholder worked for Mulvaney from 2011 to 2017, ultimately serving as his chief of staff in the U.S. House. Federal records show that in representing Santander in 2017, Binkholder has lobbied on a congressional bill to kill a CFPB rule designed to prevent financial firms from forcing customers to waive their rights to join class action lawsuits. The links between Santander and Mulvaney’s former top aide could be relevant to a major case currently before the CFPB: Reuters last week reported that under the direction of Obama holdover officials, the CFPB was preparing to sue Santander over allegations that it overcharged consumers on auto loans. However, the agency could still back off the case if Trump successfully installs Mulvaney over Cordray’s deputy, Obama holdover Leandra English. Santander’s role in issuing subprime auto loans drew immense scrutiny from the attorney general of Massachusetts, which helped secure a multi-million dollar settlement earlier this year as a result of subprime loans issued by the bank. As Jalopnik reported in July, Santander has issued auto loans with interest rates as high as 29 percent. Loan documents reviewed by the Massachusetts AG found wildly inflated incomes on loan agreements that didn’t jibe with reality. Santander also estimated that 42 percent of subprime loans created in Massachusetts between 2009-2014 have already defaulted or will end in default. So, while it’s a confounding ordeal, the Santander situation is just one example of the vast implications stemming from Trump’s appointment.